The Bollé RS Feva GP circuit moved to Thorpe Bay Yacht Club last weekend. TBYC hosted a fantastic event laying on good race management, lovely food, decent weather (especially Sunday), top class debrief & a warm welcome. The forecast was cold, cloudy but a decent breeze. In reality the 34 boats were met with light winds & hazy sun shine pushing through the high clouds. Racing started earlier than normal for a Feva GP due to tides & Race Officer Rupert Snow explained to the sailors that flood tides were slack but ebb tides rip out down the Thames. A postponement went up whilst the race team waited for the fleet to get to the race course in 5 knots of breeze. The first race got away clear but a calm patch appeared downwind of the committee boat & began creeping towards the Feva course. As the wind strength dropped boats started dropping their kites as they drifted downwind. The race was shortened to one lap & it was Jenny Smallwood & Jamie Webb first with Chay & Stirling Taylor 2nd followed in 3rd by Anna Prescott & Jess Eales. The wind disappeared, the tide started to ebb, boats struggled to stay with the committee boat so after an hour of waiting, rafted around the committee boat, racing was abandoned for the day. 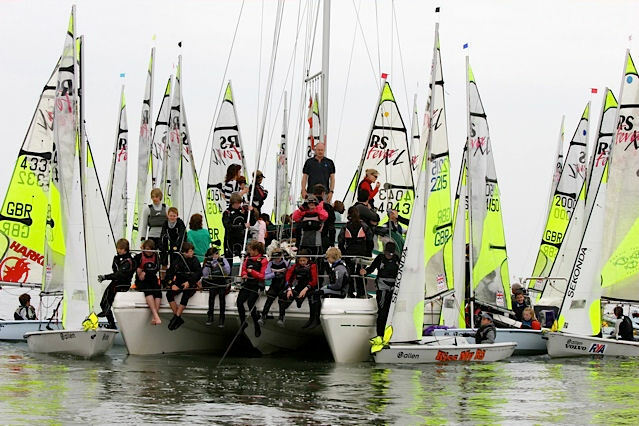 TBYC had laid on a debrief from Mark Asquith ex-49er Olympic Development Squad sailor, the informative session was followed by a complimentary meal for competitors. Sunday started grey & damp but perfect sailing conditions. The fleet got away on a black flag start after the first recall. Shifty 15 knots of breeze with flat water & slack tides meant the fleet were well split & evenly matched up the first beat. First at the windward mark was Flynn Davies & Daniel Lewis with Elliott Wells & Jake Todd 2nd & Max Mathews & Guy Rivington in 3rd. By the leeward gate it was Elliott & Jake rounding to starboard as Max & Guy rounded in unison to port through the gate. Incredibly close racing in flat out hiking conditions. The race was shortened to 3 laps but leaders Max & Guy failed to spot the flag as did Elliott & Jake. Jenny & Jamie were first to spot the flag & took another win. 2nd to finish was Anna & Jess whilst Tom Darling & Will Dolin spotted their mistake & rehoisted to make it back to the finish to stay in 3rd. The 3rd race got underway quickly & it was local boats at the front. Leading at the first mark was Jourdan Swindon & Alex Bradley with Elliott & Jake 2nd & Mo Hopper & Tally Eyre in 3rd. 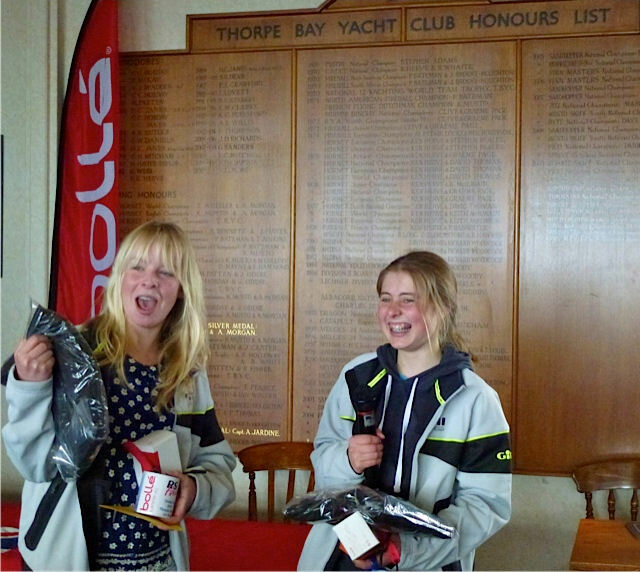 By the leeward gate Phoebe Warren & Tabby Peel had taken the lead which they held to finish as the breeze dropped to 10 knots. Max & Guy climbed to 2nd with Elliott & Jake 3rd. The 4th race saw one boat caught black flag. Leaders at the windward mark were Flynn & Daniel again with Wills Murray & Will Ormerod in 2nd then Sam Grade & Katie Prescott in 3rd. Lots of changes at the front of the fleet with different leaders at different marks eventually it was Chay & Stirling taking the lead at the final windward mark which they held to the finish. 2nd Elliott & Jake; 3rd Anna & Jess. The last race got away after a short postponement for a wind shift. The ebb tide was starting to affect the course but a big right shift half way up the beat allowed the back markers back into the race. First at the windward mark were local sailors Alex Farrell & Alex Warrington but as the breeze picked up again to 13 knots the fleet closed up. By the finish it was Tom & Will taking the win; 2nd Max & Guy. A 3rd for Anna & Jess was good enough for them to win the event. Racing was incredibly close at the front of the fleet with two points separating the top 4.